Do you ever wonder if your child is getting enough Science? As an educator and parent I have observed over the years that with more and more time focused on Reading, Writing and Math our children are not getting enough time for deeper levels of understanding of in science at school. Children need more opportunities for hands on exploration and time to process the experiments and concepts at their own pace. Are you thinking this is something I can help with at home but where to start? Do you know what concepts your child is supposed to be learning in science at school? It’s easy you can just check the Standards for their Grade Level and support from home. Your local school board website will have a link. At The Educators’ Spin On It we try our best to insure that our children have the opportunity to explore science with our After School Express Series and our Tot School Series. We share ideas that you can incorporate as a stay at home parents, after school or on the weekends with your child. You would be surprised how many other subject areas a simple science experiment can lead to… Reading, Math, Writing and more! Include a Microscope, Binoculars, Magnifying Glass, Tweezers and Containers which are all tools a Scientist Needs to explore. Provide items on a science tray such as Magnets, Rocks, Shells or Fossils to provide opportunities to explore and investigate and question. A deep understanding of a concept can come from a self-driven question. Before you get there ask your child what they want to learn about prior checking out books. Reptiles, solar energy, volcanos, insects, or chemistry, which topic will it be? Keep a list posted of the Dewey Decimal System as a menu to choose from and to record on what you’ve discovered already. Stepping out and into your garden has so many benefits to your child. Simple good nutrition is the first step as well as discovering the process from seed to plant to fruit or vegetables and all the stages in between. Does your child know where potatoes grow? Or how many peas grow in a typical pod? Have you ever really talked about the chemical & physical changes that happen while something cooks? Observe active yeast? Egg or no egg, baking soda or no baking soda? How can kneading bread change from a sticky mess to something extremely soft and smooth? It’s all explained with science. Have your children record observations of the world around them. Create a Hypothesis for an experiment they want to do. Encourage them to look at the world as a scientist would. Plan trips that support Science Concepts they are learning at school. A local trip to a science museum or park might be the first step to learning about the land forms and animal life in your area. Zoo, local nursery, Pet store, Animal Rescue, or even your neighborhood can provide real life experience of many science concepts. You would be surprised with how much you can do with baking soda, vinegar, sugar, food coloring, dish detergent, glycerin, corn starch, dirt & seeds. Plus check out Steve Spangler’s Store for some amazing options for teaching children about science. This is one of the biggest keys to remember. We need to encourage our children to think about a topic and originate their own questions and answers it prevents them from thinking outside the box. As you see them observing something, encourage them to talk about their questions and observations. It’s also a great way to build vocabulary too! Bonus Tip: Follow Steve Spangler’s Science Experiment of the Week. Plus don’t forget you can use Pinterest as a source for Science Experiments. There are always amazing experiments being shared. We have a Science Board that we encourage you to follow. 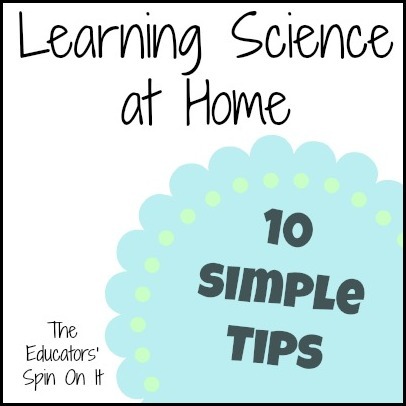 We hope that you’re able to bring science into your home with these simple tips. With these simple tips you can create great thinkers and develop a strong science background. Plus these experiences will help to build their imaginations to form the skills necessary to discover new things for our future! Kim Vij is the co-author of The Educators’ Spin On It . As an early childhood teacher and a mom of three, she’s learned many tips and tricks of parenting and teaching along the way in the past 20 years. She shares her “Educator’s Spin” on parenting issues and how to make learning playful and playtime meaningful. You can also join The Educators’ Spin On It on Facebook and Pinterest. oh I love this, perfect! I will definitely start keeping a journal!